AC/DC closed out a tumultuous 2016 by sweeping the 7th annual hennemusic Rock News Awards. The Australian-based rockers captured the titles of Rock News Artist Of The Year and Rock News Story Of The Year after they lost longtime singer Brian Johnson over hearing loss issues while Axl Rose stepped in for the remaining European and US dates on the Rock Or Bust world tour. With no live shows or releases planned for 2017, it was guitarist and co-founder Angus Young that made headlines with a series of guest appearances at Guns N’ Roses concerts during their Australian tour, including back-to-back nights in Sydney on February 10 and February 11, and in Melbourne on February 14. During the tour, an unconfirmed report out of Australia suggested that AC/DC are planning to work on a new studio album with Rose, but GNR’s touring commitments throughout 2017 would make it difficult for the pair to find room to begin the songwriting process. In March, promoters of an AC/DC concert in Seville, Spain in May 2016 were fined 15,000 euros (approx. US$16,000) over failure to supply refunds to fans who were disappointed that Johnson was replaced by Rose in the band’s lineup for the show. Johnson surfaced in April with the launch a new 6-part series, “Brian Johnson’s Life On The Road”, on Britain’s Sky Arts channel. The episodes see Johnson in conversation with some of the biggest names in rock to discuss the realities of life as high-profile musician touring the globe. On a short break from his tour, Rose kept AC/DC’s profile alive when he joined Billy Joel to perform “Highway To Hell” at Dodger Stadium in Los Angeles on May 13. Angus joined Guns N’ Roses again for a few shows on their European tour, including appearances in Hannover, Germany on June 22 and a July 12 stop in Nijmegen, Netherlands. Rose regrouped with Billy Joel for another take on “Highway To Hell” in Minneapolis, MN on July 28, while Johnson made news by joining Muse for “Back In Black” during their August 27 headlining slot at the UK's Reading Festival. Sad news in the AC/DC family came on October 22 when legendary musician and producer George Young – and older brother of guitarists Angus and Malcolm – died at the age of 70. 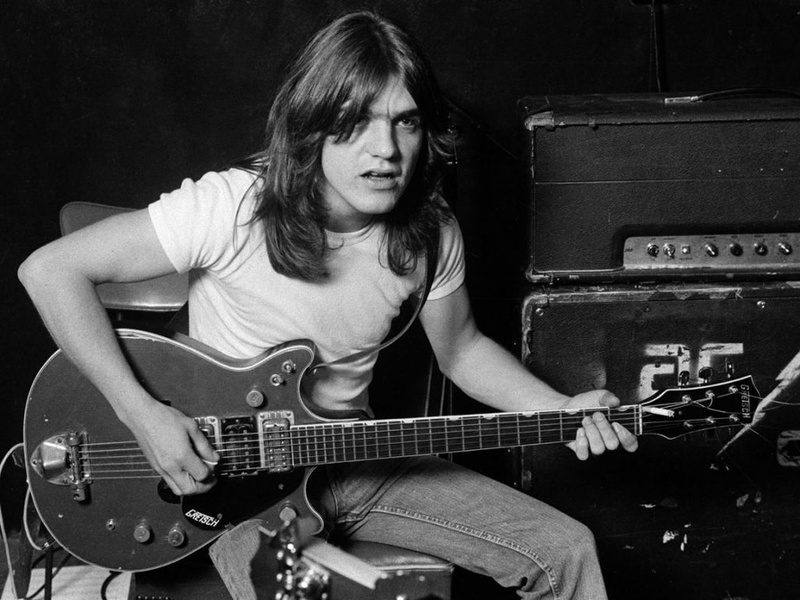 The Young family suffered another tragic loss less than a month later with news of the passing of AC/DC co-founder and rhythm guitarist Malcolm Young on November 18 at the age of 64 following a long battle with dementia. Tributes to Young poured in from across the globe ahead of the guitarist’s funeral attended by family and friends at St Mary's Cathedral in Sydney on November 28.